This meticulously maintained cruiser's LOA is 27' and it has a beam of 8'6" with a fuel capacity of 80 gal. The water capacity is 13.5 gal & the holding tank is 10gal. With a 5.7 350 MAG mercruiser engine it has plenty of power to get up and go. Easily pulls all kinds of floats/tubes. 146 hours are on the engine. The cockpit is spacious with many amenities: cabin head room 6'2", 5000 BTU air conditioning-heatpump, vacuflush system, electric stove, granite countertop, microwave, stainless steel fridge,satellite radio,CD player,MP3 input jack, galley sink. The forward dining area converts to sleeping quarters and easily sleeps 2 adults. The aft cabin also sleeps 2. Topside, you will find a built-in ice chest, transom shower, transom stereo remote control, trim taps lights,fire extinguishing system, full canvas, cockpit cover, Magma grill, fender racks, swivel captain chair/bench, extra large sun pad. Also includes a Delta anchor,stainless steel scuff plate, pull up cleats, and lots more! 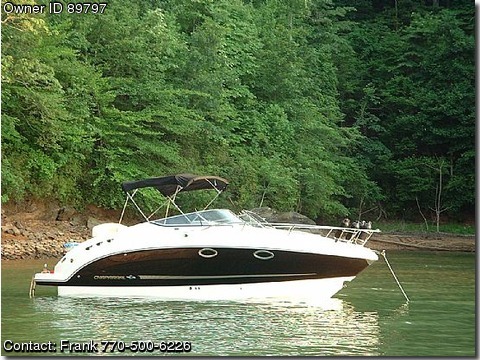 Boat is in EXCELLENT condition and is a must see to fully appreciate! THE BOAT CARRIES A LIFETIME HULL WARRANTY & 3 MORE YEARS OF WARRANTY ON THE ENGINE AND OUTDRIVE.